The Importance of A/B Testing | Sharp Innovations Blog | Sharp Innovations, Inc. So you have a great website, traffic is good and you are receiving inquires. But what about all of the visitors who come to your website and leave without contacting you? Have you ever wondered why visitors aren’t clicking on your calls-to-action or picking up the phone to contact you? It’s tempting to think having a website with all of your information displayed will be enough to entice the user to fill out a form or pick up the phone, but this isn’t always the case. So how are you tracking whether or not there are certain elements of your website that can be improved? 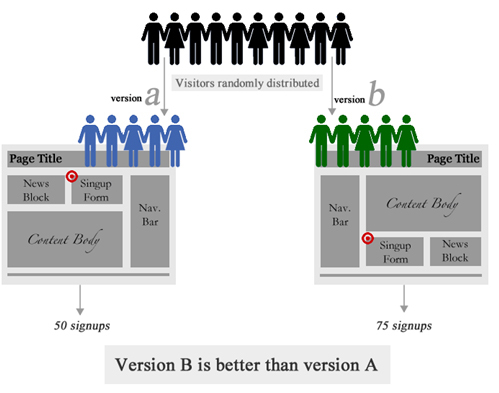 There are new methods of A/B testing that can make this tracking easy. To conduct some simple A/B testing, Google Optimizer and Google Analytics is a great place to start. Both of these tools are free to any user and offer a lot of insight into possible bottlenecks and problems that users are having with your website. Google Analytics allows you to measure click-through rates to other pages of your website once a user gets to the homepage. Google Analytics also allows you track how many interior pages users are seeing and also seeing the average amount of time someone spends on the page or whether they click to the page and exit. If the rate of exit is high on one page, that is a good indicator that there are some improvements that can be made. By narrowing down the problem pages in your website, you can start to think about improvements in usability and performance. Businesses often re-work their websites to gain better user experience and higher conversion rates, but how can they actually measure the effectiveness of new layouts and designs? Google Optimizer allows you to do that. You can keep the original page you were using and also create a new page to see which one performs better. By putting a small script in the <head> tag of your website, Google Optimizer will randomly give the visitor either page “A” or page “B.” It will then track the clicks, conversions and bounce rates of those pages and show you which pages are performing better from a user’s standpoint. This can be very helpful to improve conversions and see what further improvements can be made. Businesses are always trying to improve the number of products or services they sell. And with so many businesses relying on their website to generate leads, it’s vitally important to do A/B testing. A website often creates the first impressions a new visitor receives a business. If the look and usability of the website is poor, visitors may be apprehensive about taking action. Without A/B testing, your website may not be living up to its full potential and may be hurting your bottom line. This is especially true if you are running an e-commerce website where online sales are critical. If a user is frustrated or cannot find the information they are looking for within a short amount of time, they will leave your page and possibly never return. That is why it is crucial for your business to track bounce rates and the average amount of time a visitor spends on a page. If a visitor only spends an average of one second, and that page has a bounce rate of 80%, it is a good idea to look at the layout and elements on the page to see how you can simplify the user experience without losing the quality of content. Clickheat generates a heat map of any webpage on your website to show you where visitors are clicking the most. This can be a good indicator of where to put important calls-to-action or news on your website. More information about Clickheat can be found at http://www.labsmedia.com/clickheat/index.html. A comprehensive resource of tips, tricks and ideas. A place to share and read A/B test results. Posted in Internet Marketing on October 21, 2011 by Peter Stevenson .